I’ve always been a Chicago Bulls and Los Angeles Lakers fan. Needless to say I was thrilled when LA signed Dwight Howard and Steve Nash this year. However, I was a little cautious as things didn’t work out for the Lakers the last time they signed a bunch of stars – a while back they signed Karl Malone and Gary Payton during the twilight of their careers to play with a young Kobe Bryant and Shaq. This time around, things are a little bit different. First, Dwight Howard is in the prime of his career and is arguably the most dominating centre in the league, but his free throw shooting is probably worst than Shaq back in the day. Second, the Lakers are losing a lot of games out of the gate. During the Karl+Gary+Kobe+Shaq season, they were doing well (started the season 18-3, and finished with a record of 56-26) until the very end when they lost to the Detroit Pistons. Granted Steve Nash has been out for about 20 games with a knee injury, but one would think that Bryan, Gasol, Howard, and World Peace should be able to keep them afloat! Instead, they sit 11th in the west a quarter of the way into the season. 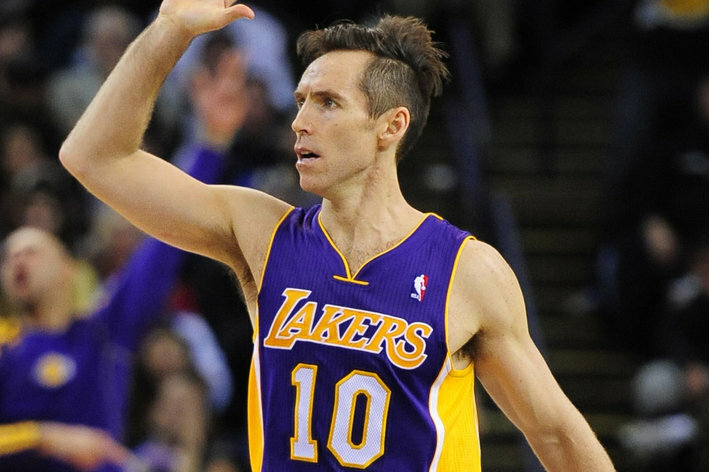 The last game they played featured the return of Steve Nash from injury, and they beat the Golden State Warriors. It’s very impressive that Nash is still able to control the game at this level given that he’s almost 40 years old! Here’s to hoping that the LA Lakers will start gelling and bring home a championship!